Your audience waits with baited breath, including the dog! Props and mellow tones to create this intimate tavern scene. 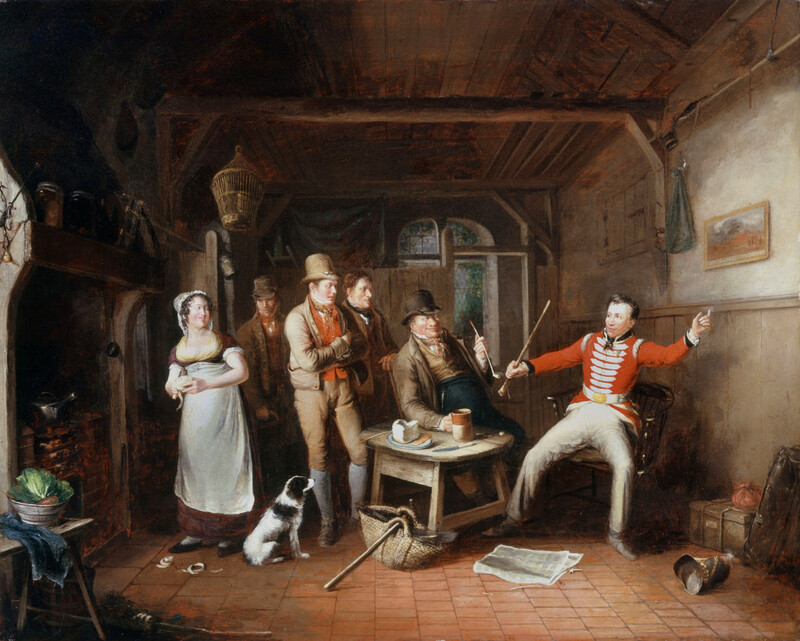 In a tavern interior, a soldier holds forth to an audience of four fellow customers and a barmaid. The subject of his tale, which he imparts to an apparently sceptical audience, is indicated by clues in the painting. He points to the print of the Battle of Waterloo on the wall and wears a Waterloo medal on his breast; he is recounting his own experiences of the battle. The Battle of Waterloo (18 June 1815) proved to be the final defeat of the French Emperor, Napoleon Bonaparte (1769-1821). Wellington’s ‘battle of giants’ determined the subsequent future of Europe. In recognition of their service at Waterloo, every man who fought in the campaign received a silver medal, impressed with his name and as a unique concession, ‘Waterloo men’ received an additional two years’ service towards their pension entitlement. Upon returning home, a number of soldiers used their pensions to open their own pubs. These publicans named their pubs after Waterloo related events – ever drunk in The Calvary Arms, The Cannon or The Wellington?- these are all nods to Waterloo.